One of the most important considerations for older pets is to keep them moving to prevent them suffering from joint pain . If they have become sedentary over the winter months, they will have lost muscle mass, which they need, to avoid suffering injuries or exhaustion from a trip to the beach. If your favorite furry has been walking regularly throughout the year a beach trip should be more fun than fatigue for them. However, excursions to the beach take a little more planning than a walk around the block or a trip to the local park. 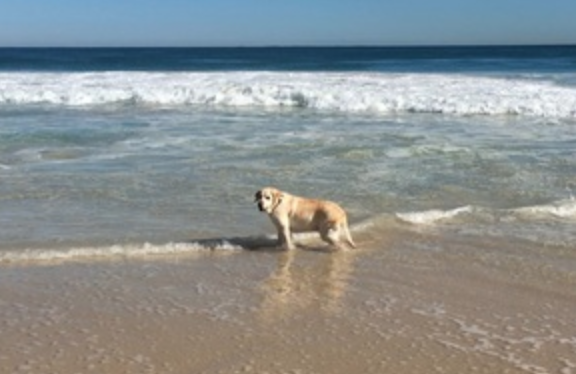 Bear in mind that their tolerance of temperature change is not as good as a younger dog, and so staying in the warm sun or lying in a cool breeze at the beach quickly becomes uncomfortable. Going early in the morning, taking shade and water, and not staying too long are the keys to a great day at the beach for beloved seniors. To improve strength heading into summer, you can help your pet with simple exercises such as sit to stand, walking on uneven surfaces, or over low obstacles. If you are planning a new exercise regime with your favorite senior it is best to start slower and progress more slowly than with a younger healthy dog, as their ability to adapt to new physiological stresses is reduced. A good rule of thumb is to progress no more than one to two components of daily life at a time. If you are looking for ideas on where to start head over to our new tricks for old dogs page. How much exercise is too much? My advice is that your pet should not be significantly worse after exercise that night or the next day. Some muscle soreness or stiffness is okay, as long as they ‘warm out of it’ within a couple of minutes of being up and moving. Would you feed your family Weetbix every meal for life?